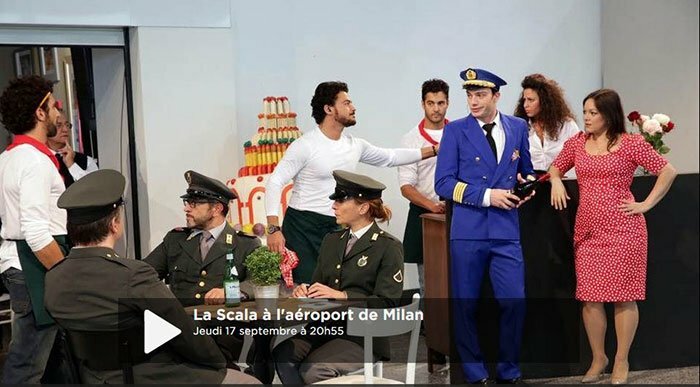 A few evenings ago, European opera buffs got a chance to see a production by La Scala of Donizetti’s L’Elisir d’Amore, accompanied by considerably fanfare and hype, when the Franco-German channel Arte did a live, remote broadcast of the work. The locale chosen was not the Milan opera house, but rather, in an ultimately silly ploy, various passenger areas of Milan’s Malpensa airport. Did the enterprise take off? Personally, I think not, but other Bostonians can judge for ourselves by watching the online video here. Oddly inept as it was, the program nonetheless was instructive and educational in several ways. To begin with, we got some sense, the unusual locale notwithstanding, of the La Scala company’s inherent strengths and weaknesses. This was a “house” production, with the old-boy network firmly in charge, from musical direction to all aspects of casting, costuming, and staging. There were some good surprises, all of these on the musical side. Fabio Luisi directed the fine-sounding La Scala orchestra, managing to keep singers and instruments together most of the time despite the two groups’ inability to see or relate to each other. The three lead singers, Vittorio Grigolo as Nemorino; Eleonora Buratto as Adina; and Michele Pertusi as the charlatan Dulcamara, all performed admirably. It is, after all, a delightful, inventive score. Grigolo and Pertusi are fine actors as well. I expect that Buratto, in addition to her ravishing voice, has genuine theatrical gifts, but she was so poorly directed (and costumed) that one is required to withhold judgement in that department. The performance was interrupted at several points, in medias res, by two breathless announcers/interviewers, asking the principals to comment on whatever bit they had just finished singing, much as sports celebrities are asked to do half-time interviews on ESPN. I felt sorry for the tenor, who had to do this after some really strenuous passages. The same commentators glossed interminably on the magic, wonderful extraordinary event they were showing us, pointing out that such a broadcast was leading inevitably towards the future of opera and of the arts in general, and just possibly towards the salvation of the human race. Bystanders at the Milan Airport were urged to give brief assent in Italian, German, and English. One or two of these were under the age of sixty, thereby proving to us that classical music has a future. And the La Scala functionaries who had generated the uninteresting staging and production design also had a chance to expound on their ideas, such as they were. L’envoi: Gadget concepts without any deeper, underlying vision whatsoever, will not save the arts. Good singers will, however, keep the lyric world alive, especially if they get better help on the production end. And Donizetti is more fun to listen to than Max Reger. Avanti!